⚙ D12252 Enlarge default window size. Use (adjusted) calculation in `SizeHint` to determine minimum window width. Enlarge default window size. Use (adjusted) calculation in `SizeHint` to determine minimum window width. Authored by sharvey on Apr 16 2018, 4:51 PM. Call setMinimumSize() at each run to enforce a minimum size. Any enlarged size will be saved and restored via the customary method of saving window geometry. Determine that window opens at an appropriate size. What if sizeHint() returns a size which is bigger than screen size? Please use QSize::boundedTo. Tested it out! The patch succeeds at altering the default size, but I'm not sure it accomplishes either of the goals of opening large enough to make the home screen and most KCMs look good, nor your intention of making it wide enough to always show both columns (not sure if we should shoot for that, either: Plasma should still be usable on a 1024x768 screen). Don't remove this, or else it becomes possible to resize the window to absurdly, unusably small sizes. The value could be changed, but we shouldn't remove this entirely. Moved to line 130; keep together with initial window size setting. I went with an arbitrary but common 800x600 for the minimum size. Can that happen, if we're basing sizeHint off the screen's physical DPI? 700 comes out a bit too large for me (see very bottom). Maybe Vlad is right and I need to run this through a better bounding function? Hmm, that's not the behavior I see at all. For me, factor appears to be 1 with not running a HiDPi scale factor, so I get an actual size that's essentially equal to the number it's multiplied by. (e.g. return QSize(1024*factor, 700*factor) yields window content that's actually 1024x700 ). If I run with QT_SCALE_FACTOR=1.3 systemsettings5, everything is scaled perfectly. Do you have some wonky DPI settings on your test box or something? While wonky things do frequently happen when I'm around, this doesn't seem to be the case. KInfoCenter reports a 96x96DPI display. I can't guarantee this is the highest-grade display on the market, though. I'll leave it at 700 rather than hack away at some weird workaround. I think I found the problem: physicalDotsPerInch() is not the correct property to be checking here, as it will vary depending on the display's pixel density. You want to change that to check devicePixelRatio() instead. That gives me perfect results. Once that's fixed, there's still one more issue here: always calling resize() this means that once the user resizes the window, that custom size will be overridden on the next launch. We want to set a better default size, not enforce a mandatory size. I wonder if we should just remove the resize() call and change setMinimumSize() to enforce 1024x700? Most KCMs look pretty bad at smaller sizes anyway. I thought about that. I figured there wasn't any harm in letting the user resize the window even if it wouldn't be saved. Do we want to go with the standard routine of saving the window geometry and restoring it the next time the user launches the application? I can work that in, maybe with a firstLaunch boolean flag that only triggers the manual setting of the window size on the very first run. The window still won't get smaller than minimumSize, but if someone wants to enlarge it, we could save that size and restore it in the future. I thought about that. I figured there wasn't any harm in letting the user resize the window even if it wouldn't be saved. User-chosen window sizes should always be saved. The only alternative is to make the window non-resizable in the first place. Do we want to go with the standard routine of saving the window geometry and restoring it the next time the user launches the application? I can work that in, maybe with a firstLaunch boolean flag that only triggers the manual setting of the window size on the very first run. The window still won't get smaller than minimumSize, but if someone wants to enlarge it, we could save that size and restore it in the future. All of this is already implemented and works as expected if you simply remove the resize() call. What needs to be done is to specify the default size without always calling resize(). Either that, or enforce 1024x700 as the minimum. Well then it's already implemented! We're only calling setMinimumSize() now; no longer using resize(). Ah, so it is! Any objections to increasing the effective minimum size to 1024x768? It seems that this is the size that the KCMs were actually designed for, so it makes sense to me as a sensible default, but let's collect some more opinions first. Heh, that wasn't a request targeted at you, but rather a question for others. :) This patch will make System Settings effectively unusable for screens smaller than 1024x768 (it's currently technically usable, but not in practice since you need to scroll nearly every KCM to see anything; it's a really bad user experience). My vote is a yes since the KCMs are themselves mostly unusable at smaller sizes, but we should still ask first. KWin adds a titlebar to the chosen window size that is itself of variable height depending on the titlebar font size. So if we want to maintain compatibility with an actual 1024x768 display, we'll need to at reduce our minimum height by 30 px or so--possibly more. Might be saner to just to back down to 700. The issue is that the KCMs themselves mostly look good at a minimum size of 1024x768. There's unfortunately such variation in their designs that some look fine at much smaller size, and a very small number require something even better, but for the most part, I think we should choose a sensible default. For people with 1336x768 screens, it's not like allowing the window to be smaller is going to be very useful to them anyway. That screen resolution is sufficiently small and low resolution that in my experience, people using it just maximize everything anyway. Why? I use some systems in portrait mode, 768x1024 pixels. Perhaps we could indeed make use of QSize::boundedTo() to make sure that no dimension of the minimum size is ever bigger than a dimension of the current screen size. That would help folks like Christoph with his 768x1024 vertical screen. I really think a minimum size of 1024x7somethingssomething represents a big improvement in usability here. With a smaller minimum size than this (given enough screen space of course), I always found myself endlessly resizing the window. With this patch, I now don't. It lends a feeling of polish and stability to System Settings that's quite unexpected and welcome. availableSize() returns size minus any size reserved by the window manager for taskbars, etc. Multiply by 0.9 to prevent systemsettings from going "full screen" and overlapping all other windows. I still object to enforce a minimum size. On my main system, I use a 4K screen, and having a file dialog span nearly the complete screen is irritating, and mostly unusable because I have to travel a lot to reach buttons. What is wrong with offering a good default size, and saving the size in case the user changes it? Why is there a need to enforce the default size as the minimum size? That's a separate bug that's irrelevant to this issue. We should fix that. If you can test (I don't have a 4K screen), I can submit a patch. 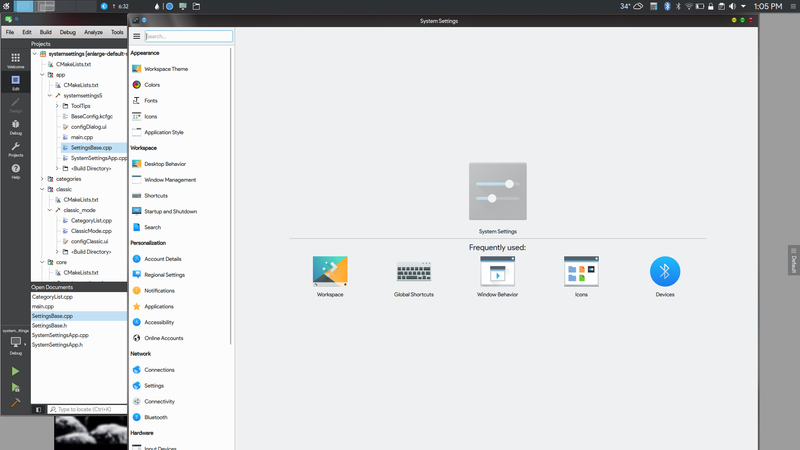 Can you outline the use case for having a large screen but wanting to resize the System Settings window to be so small that many KCMs become borderline unusable? We do save the user-specified size; this patch only prevents users with large screens from making the window so small that usability suffers. I know you were told to change to this, but don't do that. Qt will scale the size you give it here by the devicePixelRatio. This is scaling it twice which we don't want to do. We shouldn't need to be doing any custom high DPI code in window sizing. Hehe, if you want to review some of those, they're right here, ready and waiting! Confirmed. This works fine for me, so you can just remove the factor part entirely. Sorry for sending you down the wrong path! Ping! @davidedmundson or anyone else, any remaining objections to this? Do we actually need this? Remove old, unused call to KConfig "MainWindow"
It wasn't referenced anywhere else in the project. Probably a leftover from times long ago. You've already added a setMinimumSize() call below (under the "// enforce minimum window size" comment); do we need this second one here? What about icon based view mode, i.e. the old settings layout? The new settings layout(with sidebar) is still usable with window sizes smaller than 1024x700. sharvey marked an inline comment as done. Is this issue still open? The size has been discussed a couple of times. Do I need to work up something else? What about icon based view mode, i.e. the old settings layout? The new settings layout(with sidebar) is still usable with window sizes smaller than 1024x700. Many KCMs are not, though.